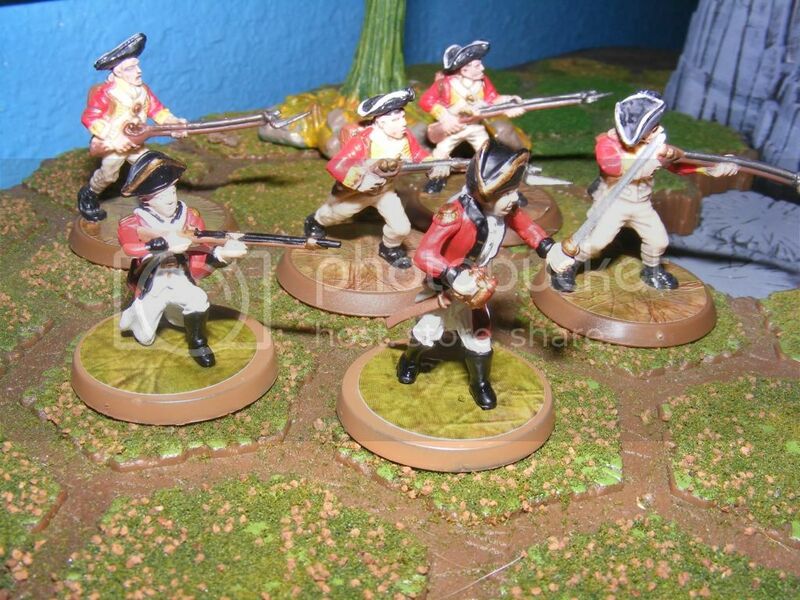 The figure used for this unit is from the Scenerama Revolutionary War pack. 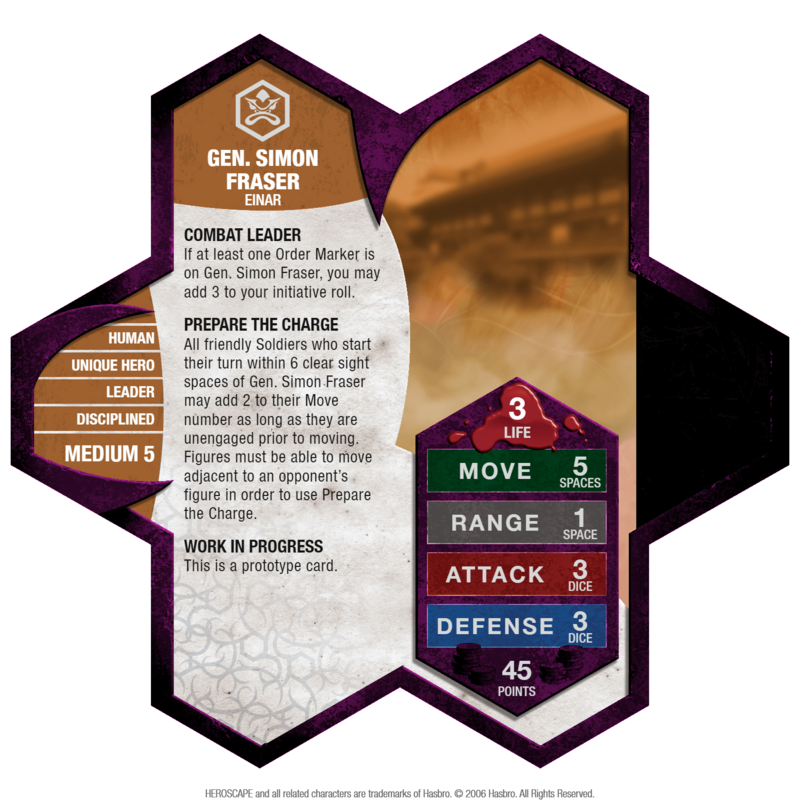 If at least one Order Marker is on Gen. Simon Fraser, you may add 3 to your initiative roll. All friendly Soldiers who start their turn within 6 clear sight spaces of Gen. Simon Fraser may add 2 to their Move number as long as they are unengaged prior to moving. Figures must be able to move adjacent to an opponent's figure in order to use Prepare the Charge. I'm definitely going to have to try this guy out with the Einar Imperium to see how it plays. Definitely not as competitive as the 10th Regiment, of course, but it'll be neat to see how all of this synergy can play together. I'm really looking forward to trying out this one. Just to be clear, Prepare the Charge necessitates that the figure ends its movement adjacent to an enemy figure, just like Charging Assault, right? Einar Imperium are a cool choice, since 2 move can be a big boost for them. 10th work, but I'm not sure they're his best use, we've found melee pairings to be good as well. I would suspect Romans/Sacred Band to be the best combo with him, but if the point totals work out, then I think that 10th is a pretty good choice, too. Admittedly, adding another squad of 10th will almost always be the "better" choice I imagine, much like adding another squad of 4th, but the build variety is really cool. The really neat thing about the Imperium to me is that he could let them stay within Kiova's range, but dart out to assassinate when it's time. It's not game-breaking or anything, but it's a really neat synergy that gets me excited to play the Einar Imperium again. After setting up the playtesting event and teaching most of the players how to play today, I was finally able to play a game, and the Suskra/Morgan's Riflemen players wanted to mix up their armies and take them against me (despite everyone else's advice). They ended up coming up with a hodgepodge that didn't work as well as they would've liked. I quickly let my Romans claim the central lane and surround Wannok, letting Marcus climb the hill before my 10th Regiment could follow. They tried splitting up Order Markers between their Wolves, Knights, and Riflemen, with very mixed results. The Riflemen were only halfway up the hill when my Redcoats completed their climb, firing down with the aid of Marcus to basically obliterate the entire squad. Marcu managed to absorb wounds from Wannok, but whiffed his attacks, and I was able to use the chokepoints near Wannok to stop them from killing more than a Roman per turn while slowly wiping out the Wolves. With the removal of the Riflemen from the play, who I had deemed the largest threat, and the basically complete securing of Wannok, they were unable to break through my defenses. Simon Fraser didn't have a huge impact on the game. His initiative bonus was almost always either unnecessary or not enough, save for one key time where I rolled a 1 and they rolled a 2. He never got an Order Marker other than my X, but I was able to use Prepare the Charge to get 2 redcoats up to 8 move in a turn and kill two wolves. I wasn't able to take advantage of the aura beyond that, because they didn't get close enough to my starting zone and I didn't feel that he was worth the numbered OM at the time. Honestly, even though he didn't do much here, I really liked him. His Combat Leader felt nice for a cheaper unit (I'd like to test it out with Buccaneers or some other squad that likes winning initiative), and it feels like a new tool to use for a variety of builds. His Prepare the Charge also has great utility, even if I wasn't able to use it here. They felt that he was a little overpowered for Combat Leader, but since it only affected 1 round out of around 6 and his Charge had less of an impact than before, I'm not inclined to agree. I think that an extra squad of Romans would've made for a more "competitive" army overall, but I really like this guy as another option. I managed to get in another game against a roommate who refused to take a playtesting unit and had only learned how to play a week ago, but who also had far more experience in strategy games and had been crafting his army out of what I had left for a good while. I made a beeline for Gerda with my Romans, while he tried splitting his Minutemen between the right and left hills. Right before I was able to reach the glyph, though, Nilfheim flew out for a reckoning, annihilating 3 10th Regiment in a single turn of icy fury. This led to a bit of a scramble as I tried to kill Nilfheim while he wreaked utter havoc against my army, basically removing all of my 10th Regiment from the picture altogether and almost all of my Romans. I was able to get some good use out of Gen. Simon Fraser's Prepare the Charge here, far more so than in the past game. It was instrumental in getting my 10th Regiment engaged to the 4th Mass. early on so that I could get the Melee Defense bonus, and I was able to use it to grab height as well in one key instance. I also surprised my opponent with one last hurrah on the 10th Regiment, blasting them out of my starting zone to engage Nilfheim on either side of Marcus for 2 attacks of 4... Both of which whiffed, but I like to imagine that in some other reality, they didn't. Despite my dire circumstances, 3 remaining Romans managed to grab height on the dragon king, though, and promptly proceeded to beat him into submission. Once Nilfheim fell, there were still many 4th Mass. and Isamu left, and I only had a single Roman, Marcus with 2 wounds, and Gen. Simon Fraser left. Through a miraculous turn of events, the Minuteman on Wannok self-destructed and I won initiative with Gen. Simon Fraser, who managed to engage and kill the few Minutemen left while only taking 2 wounds, and then fight off Isamu and climb to height and steal away the win. And I had thought that his sword was only for show. He did exceptional here. I'm almost inclined to say that he did too well, but honestly, I still think that Romans would've been a better choice for the last 50 points here. That's no big surprise given how strong squadscape is, but it makes me inclined to say that nerfing him significantly would make him pretty difficult to find a justification to use. Also, I think that a good portion of his performance came from some luck at the end. On paper, his stats certainly shouldn't have let him win the game, but he somehow managed. This map was also more suited to his Charge, since my opponent was more aggressive and the terrain was far more mountainous, making the extra movement crucial. Noticed that Fraser's aura affects friendlies, so I had to try out an epic multiplayer game. Round 1 - While the other armies are developing as usual, Mimring starts making some long range Fire Line SA’s, killing 3 Sacred Band in 2 attacks. 10th are able to get 2 wounds on Mimring in retaliation at the end of the round, and SB/KoW are still rolling on in. Round 2 - Sacred Band take initiative and one is able to use Gen. Sim. Fras.’s boost to engage Mimring and put 1 wound on him. Then 2 10th get a Marcus-boosted WTF and finish the dragon. Knights then clash with Sacred Band in that area. 2 Sacred Band are able to use Gen. Fraser’s boost to get height attacks that lead to Knight deaths. Knights kill 2 Sacred Band in return. Meanwhile 10th form a firing squad around Marcus and shoot Knights while Arrow Gruts bring in a Swog and shoot 10th and Parmenio (3 wounds). Round 3 - Knights and Sacred band do a little bit of pushing and shoving on one front, with the Knights finishing off Parmenio and pushing through (Gilbert still full health). Meanwhile the Knights are flanking on the other side as well, where there are only a few 10th in the area to shoot at them. Mid-round 2 Sacred Band are able to use Gen. Fraser’s aura to run and engage Knights on this other flank, taking height while doing so and killing 1. Knights and Orcs continue their push, killing all but 1 Sacred Band and starting to make it to the 10th and Marcus, killing 1 10th next to Marcus. On the last turn, 3 10th use Gen. Fraser’s boost to run in and engage the Knight near Marcus while also getting next to Marcus for the attack boost. They kill that Knight to death, and one 10th next to Marcus gets a successful shot on another Knight. Round 4 - The Arrow Gruts and Swog Riders had been having a hard time finding a spot to pod and get good attacks. They’d been pinging at Sacred Band on the front up until now, but with the middle area finally clear they were able to come in and do some work. One Swog and its Arrow Gruts took one of the central hills, and the Arrows took out 3 10th right off the bat. With most of the Sacred Band and Knights gone, OMs were now on Marcus and Gilbert, who engaged in combat together (spoiler: they end the round with 3 wounds each). Meanwhile 10th finish off the Knights and try to take out some of the Orcs, but only succeed in killing 1 Arrow Grut. Meanwhile more 10th are felled, with only 2 remaining at the end of the round. Round 5 - Arrow Gruts take initiative again and snipe off the final 10th, stealing a turn. Marcus and Gilbert continue hit for hit, putting one wound on each other at a time. The Arrow Gruts start taking shots at Fraser and Ferguson while Ferguson snipes back. Both Fraser and Ferguson go down to 1 life remaining, while Patrick blanks each of his two shots. Marcus edges out and is able to put Gilbert down, while he himself has 1 life remaining. Round 6 - Patrick blanks a third attack, and the Arrow Gruts put the finishing wounds on him and Gen. Fraser. Marcus attacks a Swog but is blocked, and tries to make his way out of the start zone. A swag kills Marcus and the Arrow Gruts then pot shot the final Sacred Band for the win. Use of Powers/Damage Done: Prepare the Charge - Helped Sacred Band 5 times, resulting in 1 wound on Mimring and 3 Knight kills, as well as getting height each time. It helped the 10th 3 times, resulting in 2 Knight kills. Combat Leader - Very surprisingly never came into play. Damage Done - Fraser himself never attacked, but after receiving only 1 OM during round one helped 8 different units get engaged and indirectly helped to put 1 wound on Mimring and kill 5 Knights. It was a significant loss, which I feel is attributed more to the power of Knights and Arrow Gruts and the lower tier Sacred Band occupy in comparison to them. Despite losing the overall game, Gen. Fraser felt like a significant contribution to the battle. He helped a ton with mobility for very little investment. In fact, in this team game it felt to me like too little investment. 45 points bought a 6 space aura that helped both teams, which was a noticeable bang for the buck in game. My dice were very hot and SF's were not. Not much to really tell. 4 insect squad overran the 2 activation Brigand build. How useful were playtesting units' powers and how often did they come into play? -Simon worked very well with the ants. I used his move boost 4 times to get the ants to 8 move. Any additional comments (theme, balance, fun factor with and against)? I enjoy the boost he gives to units like Ants and Imperium. I feel that Ants x4, Raelin, Fraser for 285 is very strong core.